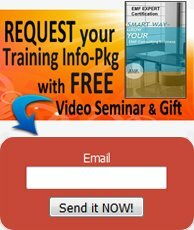 We have put together a set of EMF Videos demonstrating how to measure the EMF in the various rooms of your home, as part of the "EMF Meter Know How" download guide that is very popular with do-it-yourselfers wanting to ascertain the EMF risk in their home environment and take safety measures. Here you will see a few of the Kitchen EMF metering videos dealing with microwave ovens, that demonstrate hands-on methods of detecting and assessing EMF - the invisible electric and electronic pollution - in the typical kitchen, and how to measure it accurately with the correct EMF meter. In this video above Chris demonstrates the enormous elctromagnetic and microwave radiation fields emitted by the typical microwave oven in use, which can extend to the farthest reaches of the home, exposing everyone in it to high levels of EMF that easily penetrates walls even into to your neighbors home, especially if you live in a densely populated area. 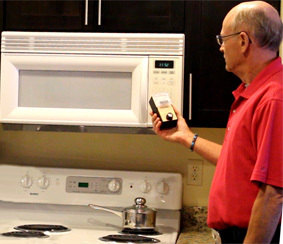 In situations where a microwave oven simply must be used, this video above demonstrates the effectiveness of shielding yourself from microwave oven radiation when it is in operation, using EMF shielding fabric. This is one example of precautionary shielding that a microwave oven user can use while cooking. This type of shielding fabric is also used in EMF clothing for personal protection. Here we see that, surprisingly, even when not in use for cooking a microwave still generates powerful EMF. This video demonstrates the simplest and most effective method of protecting yourself (others in your home and even your neighbors) from microwave radiation. It is an important distinction that these extraordinarily high levels of EMF (in the form of microwave radiation) emitted by the typical microwave oven manufactured to comply with USA and Canada Federal safety regulations was designed to keep you from being heated (ie cooked) and was not concerned with the impacts of high level EMF exposure in the larger biological sense. These EMF/EMR levels are far higher than the microwave biological safety standards now being promoted in Europe. Want to Learn More about Metering as a Reliable means of Assessing Your Exposure to EMF? 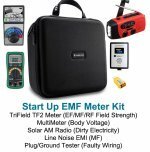 The EMF Meter Know How Guide was written for the average person in order to do just that. It is an inexpensive eBook (available by instant download) that will give you everything you need to confidently measure the EMF levels any place, whether it be your own home environment, your child's school, your friend's hospital room, public buildings or spaces, or your place of work, beginning with buying the right meter and learning to use it accurately.